One of the nice things about browser-based games is that there's such a wide variety of games available quite literally at your fingertips depending on what you're in the mood for. Last week's Closure, for instance, was an innovative puzzle game with a great spooky atmosphere - the trouble with that, though, is you have to think about what you're doing. Sometimes, you just want to turn your brain off and totally veg out - and for those moments, we have games like Magnet Towers. Magnet Towers is almost elegant in its simplicity: there are magnets that come in four different colors scattered across the board. 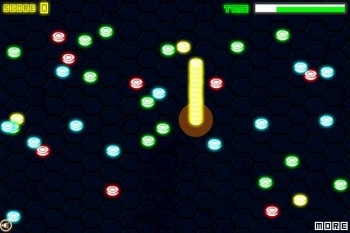 Pieces of the same color attract each other, and as you move your mouse will stack increasingly higher. However, run into a piece of a different color and your tower will explode, scattering the pieces all over the game board. Click your mouse to preemptively score your tower, removing it from play - but the higher the tower, the higher the score. That's it. Heck, it sounds more complicated than it actually is. A word of warning, though - don't blame us if you suddenly find out that you've mysteriously lost an hour of your day. With Magnet Towers, this sort of thing just happens.